Book reviews: "Before the Beginning," "The Life of the Cosmos" and "Hunting Down the Universe"
Popular books out now by three of the world's leading astronomers show two distinct paths in cosmology. Cosmology is the study of all that exists  whether one believes that to be a universe, multiverse or omniverse. As our scientific knowledge has come up to the seemingly impenetrable barrier of the "Big Bang," there are two paths for astronomers to take: Try to fill in the innumerable blanks in our picture of the visible universe or reject the idea of the Big Bang as the beginning of knowable history. American cosmologist Lee Smolin takes the latter tack, and his book, "The Life of the Cosmos," is an explanation of his theory that our universe can be proven to have descended, indeed evolved, from earlier universes. British astronomer Michael Hawkins has made filling in the blanks his life's work  but his pet theory is no less radical than Smolin's: Hawkins postulates that the great majority of stuff in our universe is neither energy nor standard matter, but invisible and hard-to-find primordial black holes each with a mass approximately that of Jupiter. And Martin Rees, Great Britain's astronomer royal, has a more mainstream approach and, while he touches on Smolin's theory, Rees takes more of a wait-and-see attitude toward his younger colleague's wilder ideas. For a lay reader (i.e., someone who has never dreamed in calculus), Rees' is by far the easiest book to read. Those without a solid grounding in physics, astronomy and cosmology are likely to quickly get lost reading the other two books. In fact, even those with a strong background in the physical sciences will find Smolin and Hawkins rough going. Rees does a nice job of patiently going through contemporary thought in cosmology and explaining just why certain anti-intuitive concepts  such as quantum theory or relativity  do, in fact, make logical sense. And Rees also shows, through easy-to-understand explanations, why astronomers now believe that galaxies must have up to nine times as much matter as we can account for through observation. (By calculating their rotation and diameter, they have determined that they are spinning far too quickly to be held together by the gravity of the matter we can see  i.e., stars, nebulae, etc.) Which makes reading Rees' book a nice intro for Hawkins'. Other aspects of current thought in cosmology  an inflationary phase during the universe's early history, string theory and the ongoing search for a unified field theory  are also given comprehensible explanations by Rees. He closes out his book by looking at the idea of multiple universes, or a multiverse, where our universe would just be one of an infinite number of expanding bubbles of matter and energy. Where Rees falls short is the same place that Stephen Hawking, Paul Davies, Timothy Ferris, Carl Sagan and other popularizers of astronomy and cosmology have failed: They get so wrapped up in their formulae that they forget to answer the basic, common-sense questions the rest of us have. Like: If the universe began to collapse into a "Big Crunch" (which depends on how much matter there is in the entire universe) and you pointed a rocket ship away from the universal center of gravity, would there be an escape velocity from the universe? Or would space itself collapse and drag us to an ultimately violent end? This is the kind of basic ignorance that so frustrates we amateur cosmologists. Black holes are actually fairly easy to understand once you think about them, but the concept of space having a finite nature  there being an "end" to space  now, that's harder to grasp. Help us, gang  don't assume we follow you, because most of us don't. But Rees' book is an excellent introduction to the current state of thought in astronomy, including advances since Hawking wrote his popular book a decade ago. The first thing you need to know about Lee Smolin is that he's not much of a writer. More on that in a second, because by far the more important thing to know about Smolin is that he's one heck of a thinker. More of a conceptualist, really, Smolin is trying to reshape the way we look at the universe and he has attempted to capture what he's up to in his book, "The Life of the Cosmos." Which only partly succeeds, the failure resting mostly on Smolin's inability to adequately express extremely complex ideas in a way that we mere human beings can comprehend. But what Smolin proposes is worth the effort, worth re-reading passages three and four times in a sometimes futile effort to grasp what he's saying. To summarize: Smolin theorizes that we exist only because our universe is descended from other universes (all part of a multiverse), and cosmological evolution has led to a point where our universe's family branch is hospitable to life. As explained by Smolin, our universe is only one of many. Universes descend from one another through the creation of black holes  either at a "Big Crunch" for those universes that collapse back upon themselves, or in the creation of any other singularity (for instance, the collapse of a large star whose mass is so great its gravity causes its matter to break down into preatomic form, and which has no physical dimensions). Which is a bit radical, but nothing others haven't proposed before. Where Smolin goes into new territory is when he proposes that universes  like life forms  evolve from generation to generation, with each universe having slightly different characteristics from its parent in terms of particle mass and force strength. He then proposes that this theory can be tested by using supercomputers to build models of universes with different values for, say, the mass of an electron or the value of gravity. According to Smolin's argument (and Rees backs him up on this), if any change in value shows a marked increase in the number of black holes that should form, then his theory is unlikely to be true. Why? Because, as with life forms, the universes that reproduce well are the ones that should dominate the landscape; if Smolin's theory is true, then statistically our universe  with, we believe, many black holes  should have characteristics close to those that will produce the most black holes (and thus the most offspring). Which is where things get sticky for most of us  and even for astronomers, for that matter. Smolin's theory is certainly not embraced by the cosmological community. Smolin's own book is also undercut by his at times harsh criticism of others for clinging to what he views as religious conceptualizations of creation. His intolerance for other ways of looking at the universe comes close to intolerance. And he himself has an almost mystical relationship with mathematics  Smolin is not really so different from those he despises. Further, while Smolin pooh-poohs the anthropic principle  the idea that our universe is the way it is simply to support human life  he still kind of buys into it. Smolin's basic question throughout is "Why is it that our universe supports life?" He then guides the reader through the physical characteristics of our universe  mass of electrons and protons, strength of gravity and electromagnetism, and explains how altering their values even a minute percentage would make life impossible. But behind that line of argument is the presumption that life must be as we find it here. Perhaps that presumption is necessary given where theoretical physics is at the moment, but if so Smolin never says so nor explains why. At some level, it seems that we find the universe is predisposed toward life because we are here. In other words, life only seems to us to be a special phenomenon because we are among its number. In a roundabout way, Smolin acknowledges this, but never gets around to asking: Is life really incredible  or do we just find it to be so because of our perspective? Even Smolin, it seems, is still anchored to the Western bias toward anthrocentrism  despite his arrogance against religion's similar view on the subject. One of the more interesting angles of Smolin's explorations is an extension of the above  his illustration that Platonic and Newtonian physics view the existence of life as somehow separate from the rest of the universe. Once you think about the above statement, you realize how true it is  and how much the idea of life being a foreigner in its own universe pervades the entire Western mind-set. From religion to science, we all view the existence of life as somehow out of the ordinary, as seemingly separate from the rest of the universe. Hand in hand with Smolin's idea of evolving universes is the idea that instead of looking at life as a fluke, perhaps the existence of what we call life is inevitable given the structure of our universe. He thinks that any model of the universe should attempt to explain life as we find it on Earth as a natural, logical extension of physics and not, as nearly all theories up to now have done, as a weird, rare and unlikely occurrence. He proposes that far from being strangers in a strange land, we are at home in this universe whose parts we are composed of. Smolin also challenges us to conceive of the cosmos as a self-organizing system, like an ecosystem. Just as a biosphere organizes itself through natural selection  so that you have predators that keep the population of herbivores in check, for instance  Smolin suggests that our universe is the way we find it for similar reasons. Just as Darwin's theory of natural selection allowed us to explain biosystems without reference to any outside forces, so might there be a similar model that would allow us to explain the universe as a whole as an integrated system. Michael Hawkins' book has a more modest aim than either Rees' or Smolin's: Assuming that our calculations are correct and the rotation and size of galaxies indicate massive amounts of matter we can't current account for, where and what is it? 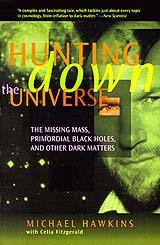 Hawkins proposes that 90 percent of the physical universe (as opposed to radiation) is composed of primordial black holes  black holes created of preatomic matter (quarks) before the universe cooled enough to form the more familiar matter we're composed of (electrons, protons, neutrons). 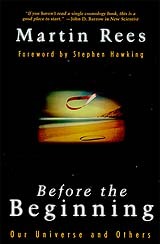 The first half of Hawkins' book sets up the foundation for understanding the issue  he does nearly as nice a job as Rees (if not in as much detail) of giving everyday, plain English explanations of quantum theory, Einstein's relativity and the Big Bang. Hawkins then uses the rest of his book to make the case for his theory. And while it's interesting, unless you're one of the top 100 mathematicians in the world, ultimately you have to either believe Hawkins or his critics without having the tools to judge for yourself who has the stronger argument. Like Smolin, Hawkins (and his critics, whom he gives full credit) have devised ways of testing his theory. Since light is affected by gravity (as proposed by Einstein, and confirmed by observation), we can confirm primordial black holes by looking for "microlensing" events where stars in the background are momentarily distorted by the gravity well of such a black hole passing between Earth and that star. If there are enough primordial black holes to account for the missing mass in the galaxies, then such microlensing events should not be all that rare. And in fact, efforts to document such microlensing events are already under way with several promising candidates having been recorded. 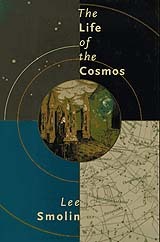 Unlike Rees and Smolin, Hawkins also spends a considerable amount of his book discussing the politics of astronomy. No doubt inspired by the outsider status of his theory, he makes the argument  backed up by numerous examples, although told from his own partisan perspective  that established astronomical institutions do not take kindly to new theories and routinely dismiss them until forced to admit the veracity of those that are proven true. To his thinking, the reception new, unproven theories receive is not a professional detachment but an outright hostility that seeks to preserve the status quo  even when it means a slower progression in our understanding of the universe. For the lay reader, it is this political aspect of Hawkins' book that may be most interesting. Even if you can't make out a calculus equation from a Greek recipe for bread, all of us can relate to huge egos refusing to be swayed by logic.